Matthew’s scene stealing Daniel Frye started off last week’s The Bridge episode in style as the Vendetta episode flashed back to how his past decisions have reflected on the characters and cases we follow now. Press have been taking notice as features with Annabeth Gish and Eric Lange have been published discussing their role on the show and we look forward to seeing if Matthew and other cast members like Ted Levine, Carlos Pratts, Johnny Dowers, Emily Rios, Thomas Wright and Catalina Sandino will have interviews too! The show creators, Meredith Stiehm and Elwood Reid answer TV Guide’s survey about running their own show and why people should tune in before the show’s finale on October 2nd! and Elwood continues to inform us of the difficulty of finding their Daniel Frye until he saw Matthew’s audition at Assignment X.
REID: We could not cast that part. We read that part for months, and I was so f***ing sick of that part, I couldn’t even watch the auditions any more. We were already getting prepped and ready to shoot, and someone said, “Oh, Matthew Lillard came in to read.” I knew Matthew Lillard, and I saw him on tape, his reading was amazing and we hired him like that. That was the luckiest thing that happened to us for casting, because that was the one role we could not cast because he was very hard to find [the right actor for]. He’s a really good actor. We feel blessed to have him. Famous Frames put a really interesting feature online with Creative Cow where they shared storyboards of the episodes and how the artists worked with the directors for each episode, beware of slight spoilers for future episodes. 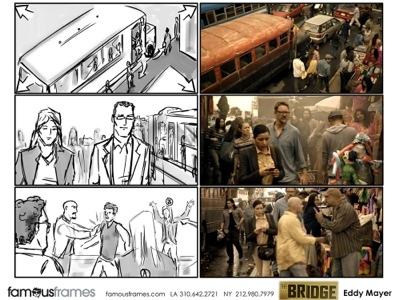 Their very different styles help illustrate a visual representation of the script for the show to work with regarding camera angles and shots they wish to use. You can see a storyboard image below with Daniel and Adriana!